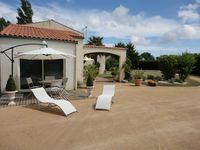 Properties in Vendée average 4.5 out of 5 stars. Property 10: Charming cottage fine performance, well located. Offering many advantages. Property 18: Charming cottage for your holidays, quiet sea proxi, large beach. Proxi The Sands. Property 40: A charming barn in rural hamlet near Sigournais, 30 minutes from Puy du Fou. C'&eacute;tait un tr&egrave;s beau s&eacute;jour avec un accueil chaleureux. De plus, c'&eacute;tait m&ecirc;me plus spacieux que je croyais selon les photos. Il y a un boulangerie &agrave; 50 m&egrave;tres et pas mal de commerce pr&egrave;s de l'appartement. 30 minutes de Puy de Fou. Seuls b&eacute;mols : Pas de wifi (c'est pas grave) et la literie est moyenne. Pourtant, on a bien dormi quand m&ecirc;me. We enjoyed our stay in Les Essarts and only wished we had a longer stay. We were there for two nights with 4 adults and 4 children. The house was bigger than it appeared to me in the photos and was well equipped with the exception of not having wifi, which is normally not a big deal when on vacation. 2 Boulangeries within easy walking distance and grocery store only a 2 minute drive away. 30 minutes to Puy de Fou (which we highly recommend!). I found the beds to be average but we didn't have any trouble sleeping. Michele was a warm host and even greeted us with a specialty from the region to sample upon our arrival. Thank you for a great stay! S&eacute;jour conforme &agrave; nos attentes, propri&eacute;taire des plus sympathique et accueillant, g&icirc;te magnifique, rien ne manque, et nous avons eu en plus le soleil et la chaleur presque toute la semaine, nous recommandons vivement cette location.